This volume collects issues #7-12 of the popular kids comic recommended for all ages. I have already read issue 7, but will start by re-reading that but what most excites me before I even start reading is that the front cover shows that the Justice League is going to turn up at some point. Let get on with it! 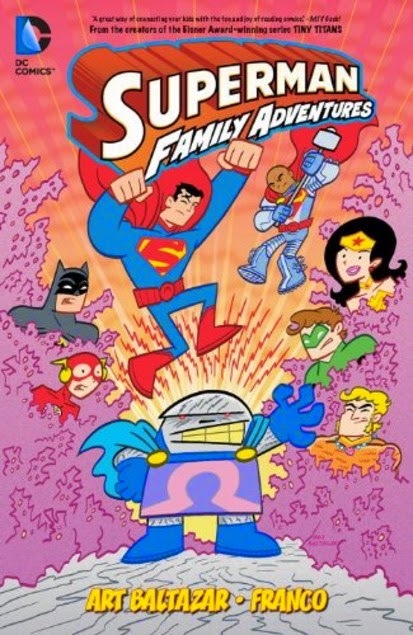 Starting off with a fun caper that brings in the Teen Titans and the Super-pets; we also end up visiting jail where we see some familiar faces from previous volumes and Lex turns up (in disguise) to pass off a piece of kryptonite. Then Brainiac appears on the scene and, in a whirlwind, Superman learns of his involvement in the fall of Krypton, sending some unnamed bad guys to the phantom zone bringing back a dearly beloved lost relative! Surprise! Then what a treat when Brainiac meets Lex and takes charge! Off they go to destroy the Superfamily and it's a hilarious riot until Lex decides he doesn't like being the henchman. Next issue has Superman bringing his father back to spend the day with his mother but coming up behind them is General Zod and his family who, once again, try to take over the world, only this time ... with kindness and hot dogs? A real hoot until Zod accidentally lets Brainiac out of the bottle! Doomsday lands on the planet but Superman has his hands full with Brainiac so this time it's Ma Kent to the rescue in an action-packed hilarious issue that has a final scene with some recent villains that's worth a good laugh. Finally, Lex gives Darkseid a call who just happens to be working his day job at the Teen Titans cafeteria. Hold onto your hat for this fantastic conclusion to the series which features the Justice League battling against Darkseid but takes the whole entire menagerie of super-pets to see things through to a happy ending. There are a few plugs in here for the new "Aw Yeah" comic series which is currently running and I'll be looking into that later on. Absolutely hilarious take on the superheroes for kids which spoofs itself and has a lot of fun not taking anything too seriously. A riot for fans young or old with big bold text for the youngest readers.